When making an investment for new countertops for your kitchen, you should think about the materials that will help these elements endure over the years in a quality manner with daily use. 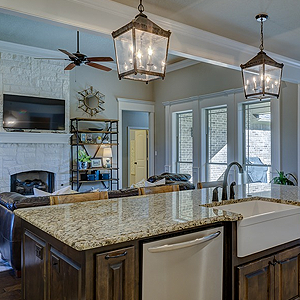 For this reason, you need to seriously consider the benefits of natural stone countertops. Marble – This stone is famous for its intricate veining that varies between slabs, expensive look and feel, and high durability with the right care. Marble is the pricier option in the stone countertops. Granite – With this stone, you receive a durable, heat and scratch resistant countertop. Quartz – Quartz is less expensive than marble, but offers a high level of heat and scratch resistant to produce a durable countertop. Soapstone – While soapstone is attractive and durable up to a point, you must care for it carefully for it to keep its resiliency. Since all of the above types of stone form in the ground in various parts of the world, the colours vary between each stone slab even within one given type, but typically, the colours include everything from whitish shades to blackish ones with numerous shades in between. The stone material lasts longer than man-made or wood materials do in a kitchen. Synthetic countertops can fade, scratch and mar easily, and show other signs of wear in the fraction of the time that stone ones do over the years. Timber ones can be resilient, but the stone ones are at the top of the list where this is concerned with countertops. Since stone countertops are both durable and attractive, and the fact that the condition of the kitchen has a major influence of the overall price that you can receive for your house if you sell it, you can increase the value of your home by replacing your old laminate countertops with stone ones. Also, you will realise a high return on this investment. To learn about additional benefits of natural stone countertops for your kitchen, consult with our team here at Concept Bathrooms & Construction. We will assist you in choosing the right type of natural stone for the way in which you use your kitchen to ensure that it suits your needs in the best possible manner. Our company promises satisfaction with our materials, products and workmanship.